It’s not often you get a chance to catch some of jungle and drum & bass’s seminal acts here in Scotland. With a small but absolutely mad fer it scene, it tends to be local grassroots names to go to for your dose of the genre we know and love. With the scene growing, and subsequently the budgets for clubnights, we are starting to see acts from further afield making the journey north of the border. This Summer will include the likes of DJ Hybrid, Chopstick Dubplate & LTJ Bukem. 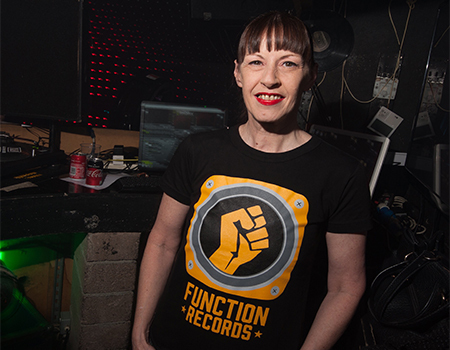 To add an absolute topper to that list, Liquid Funktion, are bringing one of the true originators to the Edinburgh - DJ Storm (with support from Fixate). Kemistry (Left) with DJ Storm. DJ Storm, often referred to as 'the first lady of drum & bass' comfortably holds legendary status within the scene. Storm started out her career DJing with her good friend Kemi back in the mid-90s. Kemistry & Storm gained notoriety at the time with their powerful, dark and thrashing sets as a dynamic duo. The pair were largely responsible for getting Goldie into dnb and essential components of the early Metalheadz label. It is hugely saddening that Kemistry passed away in a traffic accident, however, her legacy lives on strongly in memory and respect within the scene as well as through her DJ partner and friend. It is with great pleasure that we welcome Storm to Edinburgh to take us through a set of what we can only expect to be definitive bangers from across the whole length and breadth of dnb/jungle. This will be special. And what a history lesson it will be. If you want to know more about Storm, check out this recent article by Becca Emily on Dazed Digital. It looks at the 3-decade-spanning career of DJ Storm and her partner in crime, Kemistry, who pioneered the jungle and drum & bass sound. The pair inspired Goldie to follow Drum & Bass, thus playing a vital role in the formation of Metalheadz. Many female DJs that came after them like DJ Flight and Alley Cat were also influenced heavily by Storm & Kemistry.